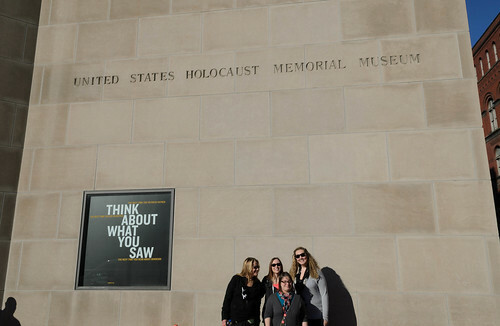 Several students from the History of the Holocaust class taught by Jehnie Reis, Ph.D., assistant professor of history, recently visited the United States Holocaust Memorial Museum and met with survivor and museum volunteer, Bob Behr. Tracie Cardone, a senior history major and political science minor, decided to go on the trip to gain new perspectives and knowledge about the Holocaust. "There was an interesting exhibit on the complicity and collaboration during the Holocaust that I learned a lot from," explained Cardone. In addition, Reis' students joined their School of Communication colleagues at the Newseum, had dinner with Point Park alumni living in the area and visited the Smithsonian National Museum of American History, among other activities, during their three-day stay in Washington, D.C.
After listening to Behr talk about his experiences, the students then met with Brad Nichols, a graduate student and fellow for the Center for Advanced Holocaust Studies. Nichols talked to the students about his research and answered questions they had related to assignments and projects they were working on for class. "My favorite part of the trip was visiting the Holocaust museum and meeting with Bob, the survivor," said Devin Yates, a junior English major with a history minor. "Because there are so few Holocaust survivors left, I was thrilled the students got to hear a survivor story first-hand. This was the highlight of the trip," remarked Reis.